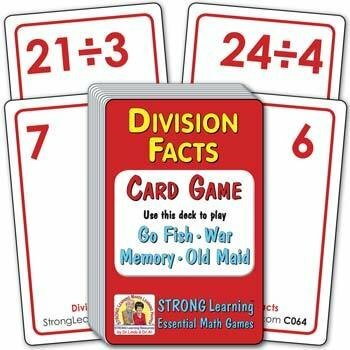 Players learn learn the division facts (that tend to give them the most difficulty) while playing popular card games. For this deck, matches are cards that represent the same value. One card shows a number as written; matching cards show two numbers. When the larger number is divided by the smaller, the result equals the value on the first card.